His Bosmer father died before he was born, murdered by poachers, Theron was raised on his Mother’s ship, The Wailing Bassilik. For a time it even sailed as a privateer vessel for the dominon, but after her Love’s death --a preventable death, had her Captain at the time, a known “Altmeri traditionalist", not gone off about the wood elf’s lycanthropy to the wrong ears-- The Wailing Basilisk began to sail under a different flag, that of a Crimson Eagle, the two swords grossly embedded into its head placing a creeping unease in the young elf's stomach whenever he stared at it too long. Nowadays, Theron hitches rides with gullible fortune seekers, sneaking off with the loot before the poor sods realize the one time they don’t see a bottle to his lips is usually the last they ever see of him, or their valuables. Appropriate or not, Theron finds it hard to take much seriously, weather a true characteristic or simply a symptom of the Jagga, Xarxes knows.. what is certain, is he’d much rather choose a life of sailing the open sea, or delving into ancient ruins in search of valuables and ancient relics. 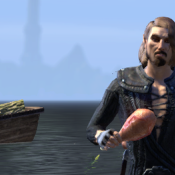 Rahjah, His Mother’s First Mate, taught him Redguard sword techniques, gifting him his scimitar when the elf decided to strike out on his own decades previously, and --even if the old coot still refused the claim even on his deathbed years later—bested him in the heated duel which ensued after his decision.